Bought this top hours before the event started because I really didn't have too much time to prepare my outfit for the day. I also opted to dress down since it's Sunday and I went to the mall with my family after the event. My latest shoe purchase from Parisian! It's edgy and sky-high but I was unbelievably relaxed while walking with these new babies. Hey I just met you, and this is craaazy. super cute top you got there! gondooo. where'd you get that? @Denise, thanks sis!! :) Parisian shoes are really lovely! 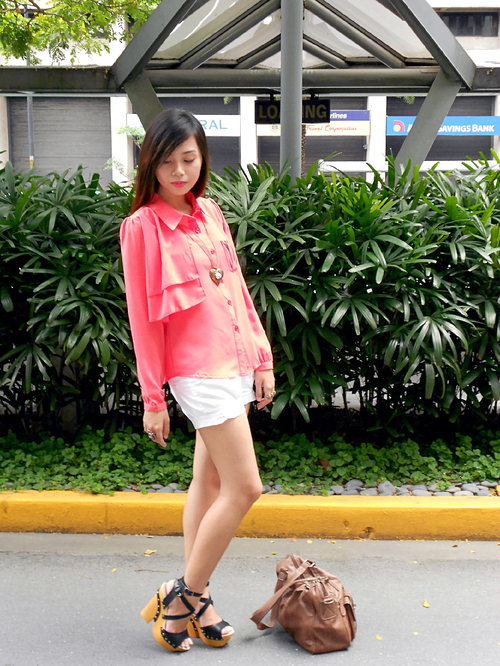 lovelovelove the top!and the shoes!!!! :) u know im so inggit napakasupportive ng parents mo!haha ang conyo!pero im happy for u of course!misssss u! @JC, thanks dear!! :) It's from iCandy of The Ramp, Crossings! @Gie, BBF!!! I miss you so much! Love love love you! Hahaha ay nako, no need for inggit, bawal yan. Adopted child ka na rin nila! :) MMMWA! @Kaye, thanks babe!! :) Starting to love tangerines lately!